"Psssst: a kid-crafted mini sukkah made with construction toys is way, way easier on you, the adult, than say, with edibles or up-cycled boxes. LEGO and Lincoln Logs and suchlike do not require you to run for the scissors and glue, to monitor frosting consumption, to vacuum pulverized Trix cereal from the rug. Any model sukkah is educational. 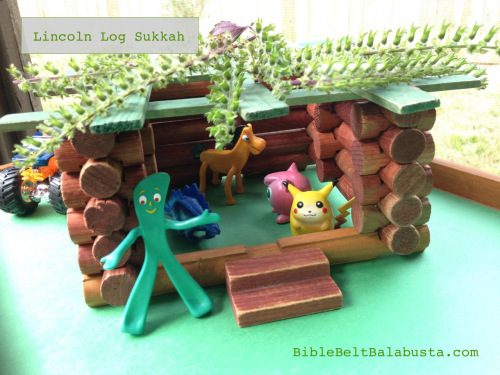 A kid-built sukkah helps prepare for and celebrate the holiday. It can teach the rules of sukkah-building (walls, roof, schach, etc.). It can teach about hospitality and the Ushpizin. It can inspire a kid-created mini lulav and etrog for maximum mitzvot. Win, win, win. But a sukkah made from construction toys is real mechaya for an exhausted parent: the materials are already underfoot and afterward, every component goes back in the box."